Being situated in the heart of Kananaskis Country comes with many great perks. Although golf might not be an option during these frosty winter months, the trade-off, along with the snow-capped mountain views are more than desirable. If you’re anything like us, staying cooped up when it’s cold out is not an option. Although we will take a cup of hot cocoa by the fireplace any day, it’s in our blood to head outdoors, breathe in the fresh mountain air, and have some good old-fashioned fun. 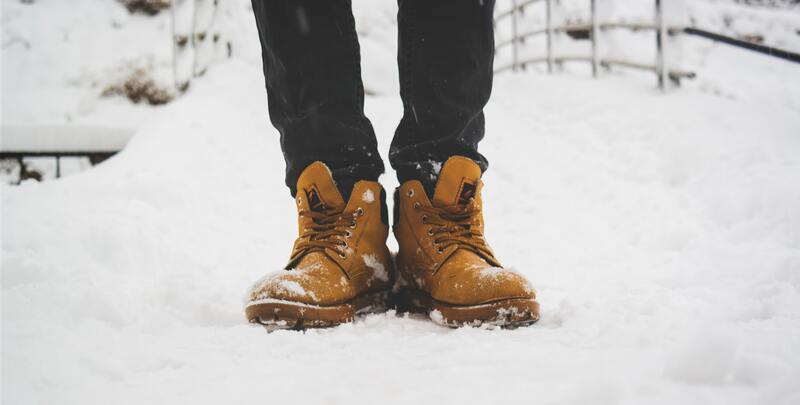 Whether it’s with the family, a group of friends, or your significant other, there are many ways you can make the most out of the winter season and embrace the chilly weather. 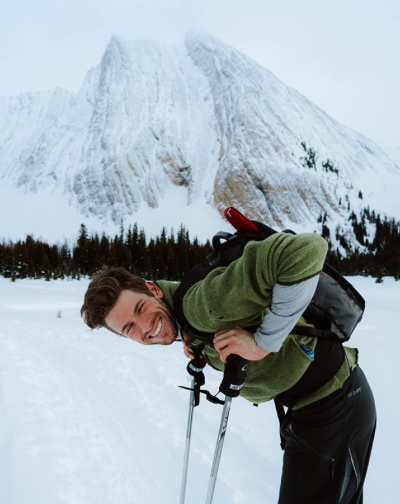 We challenge you to put on your warmest layers and head out to Kananaskis Country to begin crossing off your winter bucket list, amidst the picture-perfect surroundings of the Rocky Mountains. Don’t forget your camera! It’s never too late to pick up a new skill! Especially when it means hanging out with a crew of fun-loving doggos. 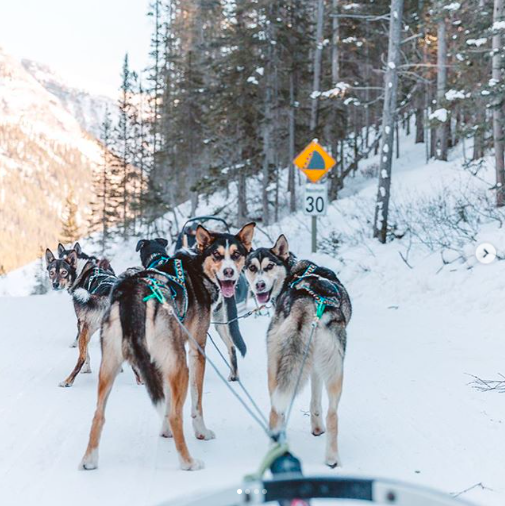 Boundary Ranch and Mad Dog & Englishmen Dog Sledding Tours have collaborated to provide a unique adventure that allows you to see the Kananaskis from a different perspective. Jump on the back of the sled and try your hand as a real musher, or take in the views from the cozy confines of the sled – the choice is yours. On the tour, you’ll learn how dog sledding played an important role in Alberta’s history as you whiz past an authentic Teepee encampment, The Trappers Cabin, and a resident Bison heard. Once you arrive at your final destination you’ll have the opportunity to tell stories around the campfire as you munch on golden marshmallows, sip on hot chocolate, and enjoy the moment of this unique all-Canadian experience! Kananaskis Nordic Spa is a much-needed apres-treat after a long day of adventuring in the outdoors. Alternatively, it’s also the perfect spot to bring a book and hang out for the day as you experience the restoring and invigorating effects of hydrotherapy in the midst of a picturesque alpine setting. 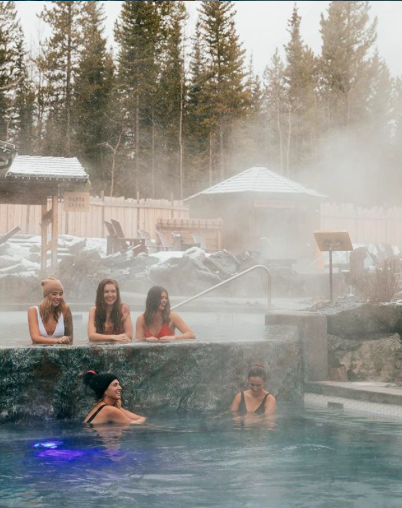 Make your way through the cycle of pools (hot, warm, cold), exfoliate your skin with an essential oil infused salt scrub, and embrace a moment of bliss, relaxation, and true rejuvenation in the Canadian Rockies. 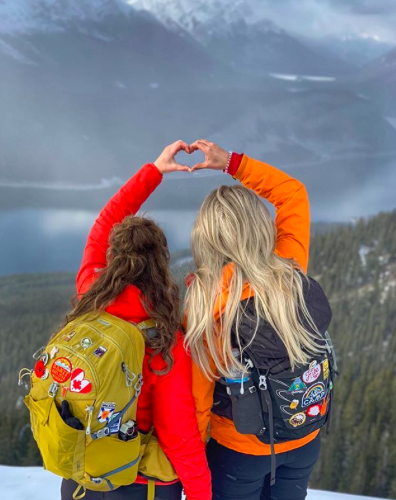 There are so many ways to experience the magical charm of Kananaskis, so why not let a trusted guide show you some of the hidden gems. Whether you’re a snow bunny trying out a new activity, or a seasoned snow seeker looking for a thrill, Kananaskis Outfitters offers equipment rental and thrilling tours for cross-country skiing, snowshoeing, and fat biking. 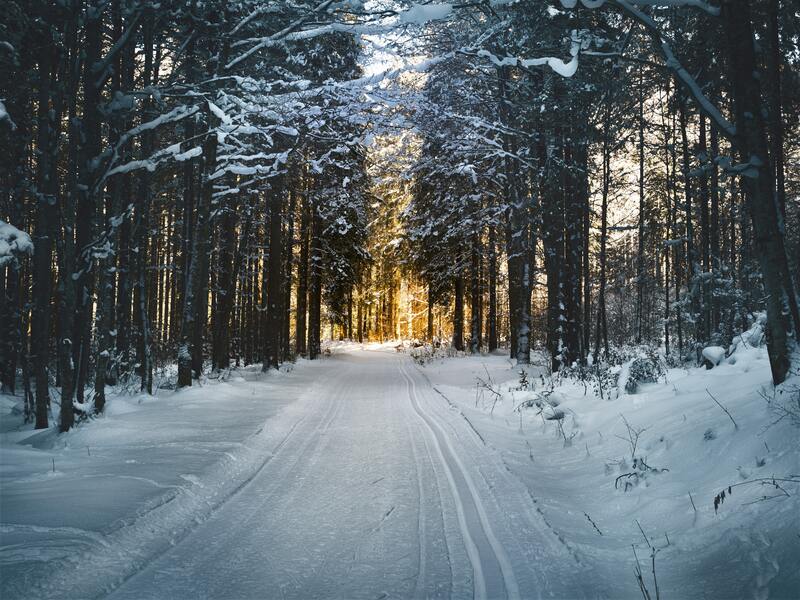 Embrace the snow-laden trails as you experience a magical winter wonderland during the day or under the stars. You might even catch a glimpse of the northern lights! Originally built to accommodate the 1988 Olympics, Nakiska Ski Hill has seen its fair share of talent on its slopes. 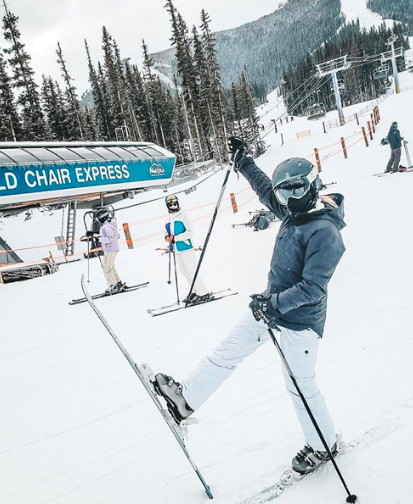 This family-friendly ski hill has runs that will accommodate any ski or snowboard ability while challenging you to take your skills that extra step further. Plus, it’s a fantastic way to work on your golf legs stay in shape for May – just saying! 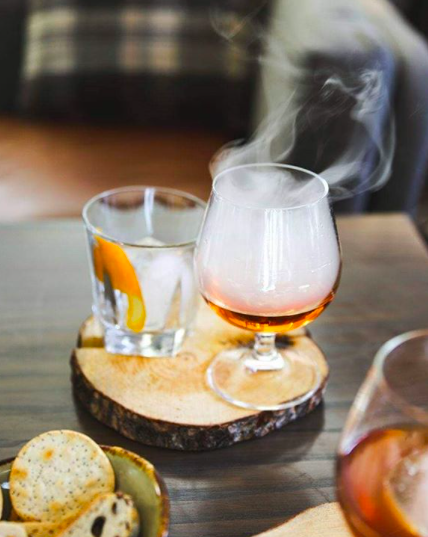 Beaudean McQueen, Head Bartender at the Pomeroy Kananaskis Mountain Lodge shakes, muddles, and blends delicious handcrafted delights that are seasonally curated and made with many local spirits and provisions. He might only figuratively light the bar on fire, but it is highly likely that he’ll set your drink a flame, depending on which concoction you order. The Blacktail Baris located in the central portion of the lodge and offers tasty culinary bites that you can munch on as you enjoy the ambiance of mountain living by a toasty campfire. Head there for a nightcap to recount your adventures from the day, or spend a night or two (or five) in the heart of Kananaskis. Whether you prefer snowshoes or spikes, there are plenty of trails that are weaved through the heart of K-Country that offer spectacular mountain views and majestic experiences through hidden waterfalls and narrow-walled canyons. Enjoy the peace and quiet as you take in the mountain air and enjoy a day unplugged, miles away from the hustle and bustle. Struggling to find the golfer(s) in your life a gift for Christmas this year? Aren’t we all! We’re a tricky breed us golfer types, especially since we love to get our hands on the latest and shiniest gizmos and gadgets as soon as they come out. So, what do you get the golfer who truly has it all? A Gift Card to KCGC of course! Purchasing a KCGC gift card will allow all the golfers in our life to get the newest products and accessories throughout the year, while prepping for the 2019 golf season. From new tech accessories that will help nail your shot or improve your handicap to stocking up on the basics to switching up your look with the latest trends in golf fashion, our golf shop has it all. Whether you’re shopping for a serious pro or a passionate weekend golfer, we can guarantee that they’ll be thrilled to find one of our KCGC cards tucked in their stocking. Here’s a helpful guide of items that they can look forward to in the new year in the KCGC Golf Shop; that will make them both a better and happy golfer! Purchase a set of balls in a sleeve of three, or by the dozen. These are a great souvenir stocking stuffer, or will come in handy for those who discovered too many #KCGCHiddensigns last season. Perfect for the techy golfer looking to improve his/her swing! This is a cost-effective option (compared to some of the similar working products out there) that will give you a precise measurement of your shot on the range. Practice makes perfect, right? Find out more about this new accessory, along with some new golf gift gadgets on the Breaking Eighty by golf blogger, Sean Ogle. Our golf shop features over 50 designs of fun and trendy Golf Caps that will help you show off your favourite golf course in style! Clean your clubs and balls with a stylish and colourful KCGC branded towel. It's the perfect way to keep a little piece of KCGC with you no matter where you're golfing! Help us keep our beautiful greens in tip-top shape by purchasing one of the many colourful divot tools here in our Golf Shop. The switchblade technology helps to ensure you don't rip or tear the pockets in your pants while you play. From rain gear, to vibrantly patterned, interchangeable shirts and pants options, our golf shop is stocked with the latest in golf fashion, that will at least make you look like you know what you’re doing out there on the course. This year there are many pieces inspired by decades past, that feature a modern twist, while still remaining comfy, breathable, and performance driven. Note: KCGC gift cards can also be used to enjoy green fees on both the Mt. Kidd and Mt. 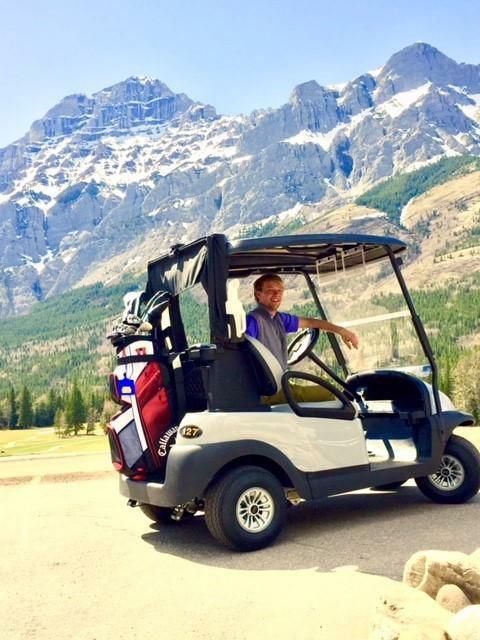 Lorette courses, take a ride in one of our beautiful new power carts, enjoy a meal at Summit Restaurant and Lounge, and shop all of the merchandise and accessories in our Golf Shop. A KCGC gift card is the gift that keeps on giving! ** Stay tuned for the opening of our new online store, coming in early 2019. You’ll have the opportunity to shop all our products and accessories before the 2019 season hits! An Ugly Christmas Sweater– golf style! There’s nothing stopping you from wearing this on a chilly day during the season – no one will judge, we promise. For the golfer that doesn’t take him/herself too seriously on the course. For the golfer who relies on those beats for full concentration when working on his/her swing. Merry Christmas .2018! from Kananaskis Country Golf Course on Vimeo. Disclaimer: our confirmation email is proof that your Gift Card is on its way. Feel free to print this confirmation off and fold it up in a card for your loved ones if the physical card has not arrived by Christmas Day. Our little elves are doing their best to ensure that these get out to you in time, but there is no guarantee when they will arrive once they get put in the hands of Canada Post. Our apologies, but thank you for your patience and understanding! It’s the smiles, it’s the laughter, and it’s the unforgettable memories that are created on and off the course, that make Kananaskis Country Golf Course so special to many. Having the course re-open as a 36-hole facility for the 2018 season, means we can now continue to host generations of golfers, long-standing Albertans, and guests travelling to the Canadian Rockies from overseas. And speaking of hosting guests, we had the opportunity to welcome two well-known golfers in the industry this past season: Sean Ogle of ‘Breaking Eighty,’ and Scott Lindsay of ‘The Weekend Golfer,’ both breaking boundaries and making the world of golf a more accessible sport – each in their signature way. The reason we love these Sean and Scott so much is because to of their ability to have so much fun out on the course, while still scoring unbelievable scores. They have the ability to see the game of golf through the lens of so many different skill levels of golfers. 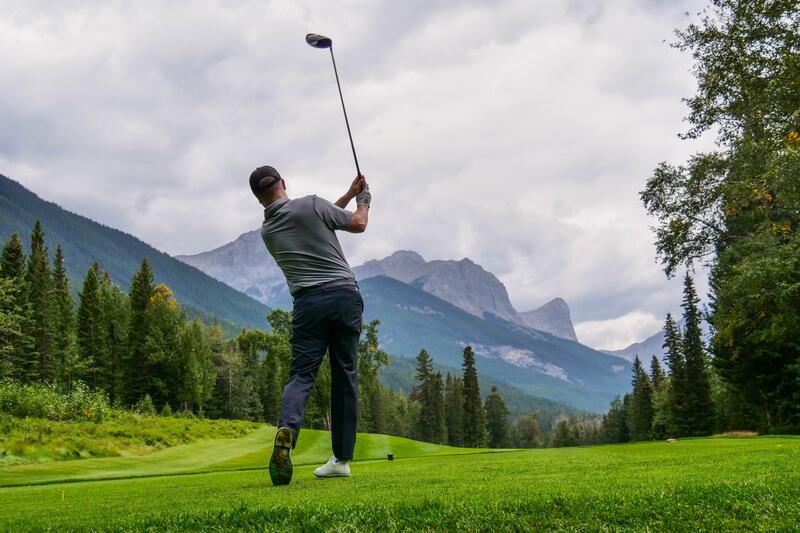 Bringing back the passion, the enjoyment, and the gaiety back into the sport of golf is what Kananaskis Country Golf Course is all about – and let us tell you, spending time with these two was our absolute pleasure. We sat down with them after their round to hear their take on the course, and hear everything from their best golf hacks to their take on Canadian Rockies’ golf. What were you looking forward to the most, leading up to your trip to Kananaskis Country Golf Course? Sean: It has been most incredible seeing a place that was completely devastated, rebuilt. We have heard so many stories about the redevlopment of the courses here in Kananaskis, and hearing the details from Bob and Darren were mind-blowing. Then, actually getting to see the final result in person gave it that extra wow-factor. The mountain views make this place very special. Scott: This course was in the Top 20 Courses in Canada and had to be restored from essentially nothing – that story in itself is awesome. The views, wildlife, and remoteness of this world-class course make it so unique. It feels like you’re in the middle of the woods, it’s by far the most remote course I have ever played. What is your reaction to the restoration of the course – hearing the before and seeing the after? Sean: My first reaction is that they are doing everything right. The early 70s and 80s were a dark age for golf – in terms of making the game as challenging as possible - and within this restoration they have hit every aspect of a modern world-class golf course; it’s a course for everyone. From the club, the initial greeting when you drive up, the service, and the tees they’ve thought of everything! Scott: I think their ability to rebuild the course without any permanent scars is super impressive. If you didn’t know the story and the history, you would be out there playing without even knowing it. Incorporating their new starter tee boxes is key to welcoming new or less-ecperienced golfers – that was smart. Most courses are following suit and building smaller par 3 courses, because it’s more about the experience on the course these days, rather than playing to an extreme level of difficulty. What sets this course apart from others in the area? Sean: It’s a world class course that is accessible to everyone – simple. Hearing about how much this place means to the locals, and that the KCGC team recognizes that is so special. Their emphasis to make it accessible to golfers of all levels during the reconstruction says a lot. Scott: Aside from the gorgeous views at every turn, it’s the people. There is a greeter at the door that ensures you know where to go, which gives it this consistent family-like atmosphere – and you feel this throughout the entirety of the course. It’s also incredibly affordable, and has a great pace-of-play, and is located in the heart of this stunning mountain range. That’s the trilogy of what every course should have! What do you love about the Canadian Rockies? Sean: Hands down the views, it’s spectacular out here. No matter what you’re doing, it’s made that much better by the backdrop! Scott: You’re immersed in the woods and the mountains and completely in nature. The beautiful aesthetic is followed through, no matter where you go. Everything out here embodies the authentic mountain life and makes it a life-changing destination. What else (other than golf) would you recommend experiencing in the Rockies? Sean: The Icefield Parkway (Highway 93) road trip. That drive is breathtaking set to the backdrop of crisp blue lakes and rugged mountains. There’s really nothing like it anywhere else in the world! Scott: The Gondola ride up to the summit of Banff’s Sulphur Mountain is super impressive, along with witnessing the green and blue lakes. There is just something about seeing it in person that does it more justice than the photos. What is your go-to snack to refuel out on the course? Scott: Beef Jerky – no questions asked! What is your top golf hack? Sean: When you’re golfing and traveling, always bring soft spike shoes. I wear ECCO shoes, so I don’t have to worry about them when I’m on the road. Plus, then you don’t have to change your shoes when you head to the bar afterward! Scott: I use my wife’s nail polish to mark my ball, it stays on better than a permanent marker. Shameless, but hey, it works! What adjectives would you use to describe this area? Sean: Grand. Everything from the courses to the mountains, to the hotels. Everything about this experience has been big. Scott: Breathtaking and inspiring. This place truly inspires you to keep on playing golf. It’s truly rejuvenating. It’s no secret that the key to the winning formula of KCGC 2.0. is not only the uninterrupted mountain views, but the people. From the team we employ to everyone (golfers and non-golfers) that ‘make the time’ to play a round or hang out at the course, it’s the KCGC family that makes this place truly special! 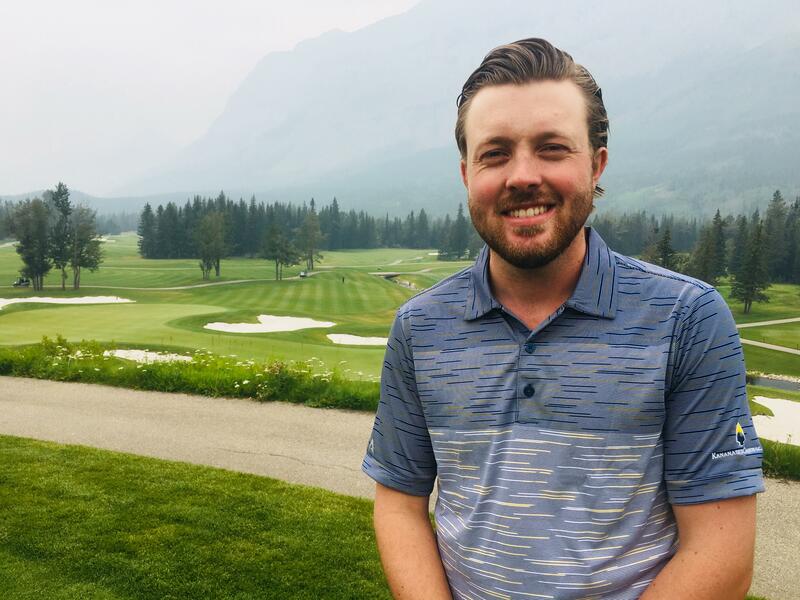 If you’ve had the opportunity to #PlaytheK, chances are you’ve likely run into our Assistant Golf Professional, Chris Cooke, in one way or another. From greeting guests and ensuring everyone is set up properly for their tee times to knowing all of the products we sell inside-and-out, Chris is your go-to-guy. For us, it’s important for you to get to know the expert team behind KCGC 2.0. So, we caught up with Chris in-between Greens to ask him a few questions and learn more about him, both on and off the course. What is your role at KCGC? CC: I am the Assistant Golf Professional and Manager of the Golf shop, working under the one-and-only Bob Paley, who is an incredible mentor. It’s my job to make sure everyone is set up for success, and that starts off with greeting everyone and making sure our guests feel comfortable as they arrive. I teach clinics out on the driving range, organize our starters and ambassadors, ensure everyone is keeping the pace, and get everyone out on the course as timely as possible. Essentially, I always want our guests to feel that personal touch on the course. We are a family and we want our guests to feel that from start to finish. What are you most excited for, looking ahead to next season? CC: Probably knowing that we will be starting off the 2019 season next with a full 36. Seeing everyone back at this course this year was magical. Everyone has a story and a memory that provided a touchpoint between them and the course from previous years. Everyone has had a huge smile on their face and are so excited to jump onto the course – it was amazing to witness and be a part of that. What’s your background – what led you to work here at this course amidst the Rockies? CC: I was born and raised in Canmore and essentially grew up on the golf course. 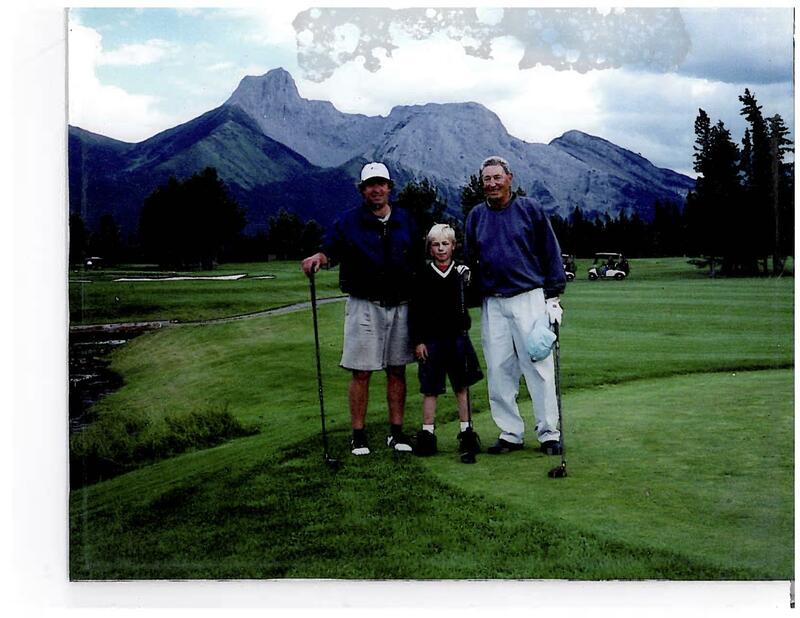 My dad worked at the Canmore Golf and Country Club, so I started playing young. I played junior and eventually got a golf scholarship to go to the University of Arkansas and played at courses around North America. When I graduated I knew I had to come back to Canada, I love it here. I worked under my dad for a bit, but KCGC was always on my radar. So, when the position came up I jumped on it and haven’t looked back since! What do you love most about the Kananaskis Region? CC: It’s just you and the wildlife – it’s about as tranquil as it gets. From riding at Boundary Ranch to hiking to snowboarding to swimming in the many lakes, there is always something to do within a close-knit community. Plus, the fact that we have established a 36-hole world-class golf course, essentially in the middle of a mountain park is amazing. 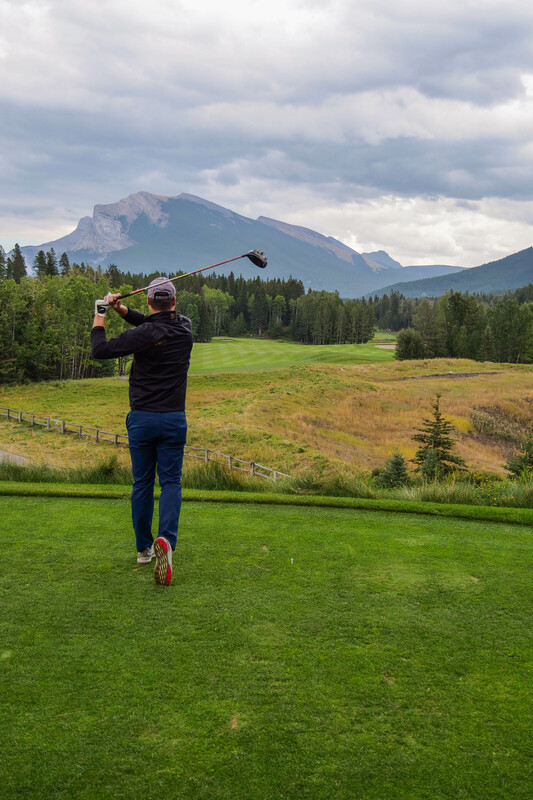 Kananaskis is truly a picturesque destination and we’re extremely proud of our two 18-hole course layouts [and we don’t shy away from owning the bragging rights]! Although the majestic Mt. Lorette and Mt. Kidd both shine their glory down onto the course giving golfers the perfect backdrop for their Insta-worthy swing, the course itself doesn’t stay this beautiful on its own - it’s due to the daily dedication of our incredible turf-care team, led by Superintendent, Calvin McNeely. Thanks to Calvin and his team, you will find the course in pristine condition at all times – these guys never miss even the slightest wilted flower. On his team you’ll find Zachary Bishop, Second Assistant Superintendent, who joined the KCGC family in May. For us, it’s important for you to get to know the expert team behind KCGC 2.0. So, we caught up with Zach in-between Greens to ask him a few questions and learn more about him, both on and off the course. KCGC: What does a day in the life of a Second Assistant Superintendent entail? Zach: Essentially, I help direct the grounds team and participate in the maintenance and conditioning of the golf course - to ensure it always meets its world-class standard. My day typically begins at 4:30 am and I meet the team at 5:30 am to begin preparing the course for play, while assisting Calvin to ensure that all of our daily goals are accomplished. I then spend the rest of the day planning out schedules and assessing the course for areas that require specific attention. KCGC: What was your role in the launch of KCGC 2.0? Zach: I joined KCGC back in May of this year, when most of the course construction was complete. I did get to see the construction process as they finished up the last five holes, which was a super unique experience for me. It was my job to learn how to manage the crew and further grow in my role – since Mt. Lorette was already complete it provided the perfect training platform. I was also very involved in the preparation and completion of the Mt. Kidd course which opened on June 1(Front 9) and August 1 (Back 9). KCGC: What’s the difference between maintaining a course in the mountains vs a course in the city? Zach:The number one thing would be the wildlife presence! Having everything from elk, deer, and moose, to bears, we have to ensure that golfers are respectful of these animals and that in turn, the wildlife doesn’t prevent any interference with play. There is never a dull moment at KCGC – I can guarantee you that! KCGC: What’s your background – what lead you to working here at a course in the midst of the Rockies? Zach:I have grown up in the golf industry my whole life with my father being a Golf Course Superintendent. After working on golf courses in Calgary over the years, I enrolled myself in the Turf Grass Management program at Olds College in 2016. Two years later, I was lucky enough to get connected to KCGC right away. The primary goal I was looking for after graduation was finding a golf course where I could learn, grow and most importantly, be mentored. Working under Calvin McNeely has been an incredible opportunity and then some. His dedication to his craft is contagious and makes the work we do here incredibly rewarding! What's up...I hear there are no tee times left for 2018?